Many people might say that hip flasks and chess don’t really go together. Wrong! Well in my opinion anyways.. Chess is a social game and a thinking game and so sometimes a wee dram can help.. Many an evening have Simon and I sat up with a glass of wine or a spirit of some kind and played until the small hours. We have even played chess with friends over a whiskey or two. Sometimes the drink helps to loosen the mind and other times, well it does not help at all. Too much and it throws you very much off of your game. Moderation is key – hip flasks can help with this. Chess is said to have originated in the Gupta Empire of India between c. 280-550 and was known as chaturaṅga. Chaturanga is a Sanskrit word which means 4 divisions. This was based on the military as it is a game of strategy. The divisions were infantry, cavalry, elephants and chariotry. These 4 were represented in the game by pawn, knight, bishop and rook. As a result of time, the game was of course modified from the original, as happens with everything and became known in English as Check or Chess. The strategy was still the same but modifications were made so that it could translate across the countries. Because word had spread and everyone wanted to try it. In this era, the game is played by millions of people. Adults and children alike. Taught at a young age and kids can become absolute whizz’s. For instance, many kids have gone on to beat adults and become masters. Across the globe, because the game is so sociable it is played in so many places. For example, there are chess tables in the parks of America which can be used by anyone at any time. All walks of life can enjoy a good game of chess. However old and whatever colour or gender, you are welcomed. In the UK, chess boards can be found in pubs, youth centres and in so many other public places. Strategy games are great brain training and help to keep the mind young. 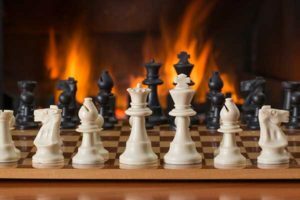 Although it can be played anywhere, depending on what you have, not all chess sets are the easiest to carry around with you. Well, here at The Pocket Hip Flask Co, we have a solution for you and are here to help. The solution comes in the form of our new hip flask and cups chess set. The hip flask and cups are made from quality stainless steel and are presented in a lovely wooden box which also doubles up as the chess board. The individual pieces nestle safely inside the box. And viola – you can now take your game anywhere you like and as there are cups in the set, both you and your opponent can have a little drink. If you want to share that is! If you are anything like us and you have more than one hip flask then you can mix and match and pop whatever one you like in the box depending on the occasion and the company you will be keeping that day. These hip flasks and chess sets make fantastic gifts for all occasions. If you have never played before and would like to give it a go then there are so many sites online that can help. Click here for some tips.